Ever since the debut of Intel's Core i7 platform, the cost of switching to the new platform has been one of the major concerns among enthusiasts. The processor itself actually is quite reasonable for its price but that's just part of the equation. 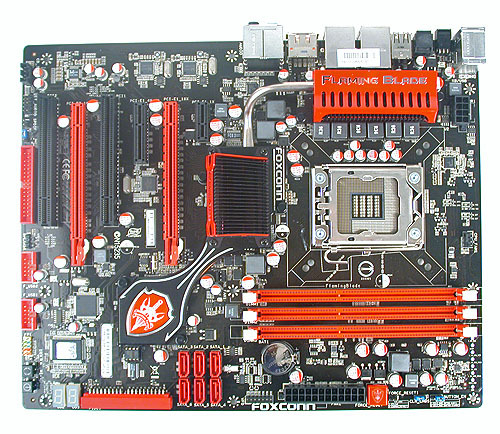 Not only does the platform require the more costly DDR3 memory, the motherboards that launched with the Core i7 were targeted (quite naturally) at the high-end enthusiast market. Hence, the general impression has been that the Core i7 platform involves quite a hefty chunk of cash, something that rival AMD has also played up when marketing its Phenom II processors. Now that the Core i7 has been around for a while, the vendors have started to scale down their boards' feature sets and produce more reasonably priced versions. Foxconn's latest Flaming Blade series of X58 motherboards is going down such a path. With a price point of around US$200, these boards are designed with a more reasonable set of features, like only having two PCIe x 16 slots for dual graphics cards instead of the three or four slots found on more expensive boards. Therefore, performance to price ratio is the main goal here. There are two models available in this series, the Flaming Blade and the Flaming Blade GTI. The main differences are that the GTI uses a ICH10 Southbridge, so there's no RAID functionality and it can only do ATI CrossFireX and not both CrossFireX and SLI, because the SLI certification is an additional cost. The GTI version also lacks a second Gigabit LAN controller and it has no eSATA ports too.